Description: Evangelicals are supposed to be experts at telling their story. From an early age you are expected to have a ""testimony,"" a story of how God saved you from a life of sin and sadness and gave you a new life of joy and gladness. What happens if you don't have such a testimony? What if your story just doesn't fit the before-and-after mold? What are you supposed to do if your voice is not one usually heard? 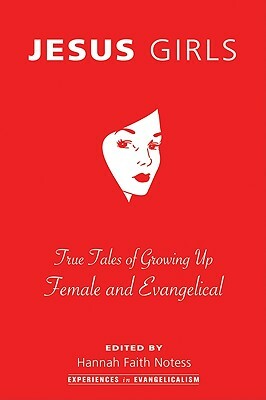 In these offbeat, witty, and often bittersweet essays, up-and-coming writers tell the truth about growing up female and evangelical. Whether they stayed in the church or not, evangelicalism has shaped their spiritual lives. Eschewing evangelical clich's, idyllic depictions of Christian upbringing, and pat formulas of sinner-to-saint transformation, these writers reflect frankly on childhoods filled with flannel board Jesuses, Christian ""rap"" music, and Bible memorization competitions. Along the way they find insight in the strangest places--the community swimming pool, Casey Kasem's American Top 40, and an Indian mosque. Together this collection of essays provides a vivid and diverse portrait of life in the evangelical church, warts and all. List of Contributors: Jessica Belt Paula Carter Kirsten Cruzen Anne Dayton Kimberly B. George Carla-Elaine Johnson Megan Kirschner Anastasia McAteer Melanie Springer Mock Audrey Molina Victoria Moon Shauna Niequist Hannah Faith Notess Andrea Palpant Dilley Angie Romines Andrea Saylor Nicole Sheets Shari MacDonald Strong Stephanie Tombari Heather Baker Utley Jessie van Eerden Sara Zarr Endorsements: ""Written by experienced women writers from diverse evangelical Christian backgrounds, the tales are honest, approachable and revealing. Each author has put aside her inhibitions about exposing the flaws of her home church--from power struggles to the indoctrination of shame--and takes evangelicalism to task for its 'carefully filtered' yet ambiguous conventions. Yet all of the authors tell of a more realistic, meandering faith, enduring even while rife with doubt. Readers will be inspired to re-examine their own beliefs and perhaps even create their own un-testimonies."" -- Publishers Weekly ""OK, male Evangelicals . . . it's time: you need to listen to your sisters, mothers, and daughters. Their voices have been marginalized for too long, and as you'll see in these pages, they have some tremendous stories to tell (or 'testimonies to share'). ""OK, female Evangelicals . . . it's time: spread the word on this amazing collection of essays. I've never seen anything like it, and I think you'll agree. ""OK, non-Evangelicals . . . it's time: if you thought all Evangelical women were sitting quietly in church or baking casseroles for the next pot-luck, all the while dreaming of the next election in which they can vote right-wing . . . here's a jolt and a pleasant surprise for you. Another great collection of deep feeling, honest thinking, and splendid writing from the folks at The Other Journal."" --Brian D. McLaren, author of The Secret Message of Jesus ""Since the Puritans, spiritual autobiography has thrived in the New World. These women show that the American conversion testimony is endlessly resilient, as they break and remake it again and again. There's a wild range of piety here, but the authors do believe in the possibilities of narrative. Intelligent and sensitive, their essays brilliantly shatter the born-again-bimbo stereotype "" --Julia Spicher Kasdorf, author of The Body and the Book: Writing from a Mennonite Life ""A marvelous writer herself, Hannah Notess has gathered here a circle of riveting storytellers. Speaking from their own experience, these women reframe the ancient religious questions in contemporary language--questions about suffering, sin, and salvation, about the source and purpose and conduct of life. Above all they ask what Christianity meant to them when they were growing up, and what it means to them now. Their answers are as varied and rich.